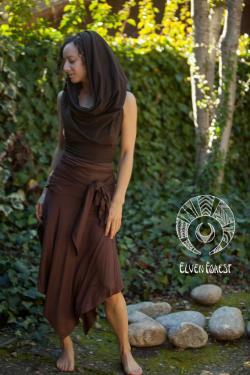 Cowl hood crop top with long strings you can wrap around your torso or around the shirt itself . One size fits most - this is a very unique pattern and molds to nearly anyone's body. If your bust measurement is larger than 38, let me know in the message box upon checkout, and we will make you a custom size. This is the same top that comes with the convertible jumpsuit. Please message me with any questions.